A new development has been announced by the Town of Ajax that will replace Ajax Plaza on the west side of Harwood Avenue just south of Highway 401, across from Ajax Town Hall and library. 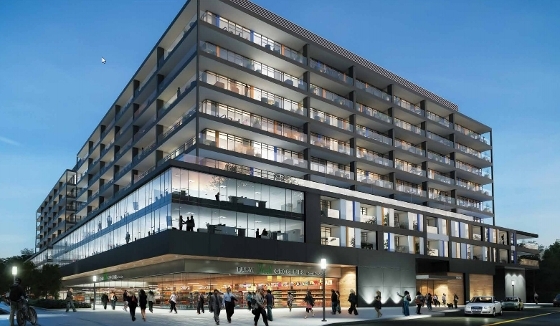 The name of the new project is Grand Harwood Place, and includes two 10-storey buildings. The first phase of the project includes the two towers - condominium buildings with 268 units with 30,000 square feet of retail space and 25,000 square feet of office space, complemented with underground and decked parking. Phase 1B is slated to include 84 townhouses and will be behind the towers, along Commercial Avenue. Two additional phases are slated for the future. Construction is estimated to cost $118.7 million, creating 206 jobs and creating property tax revenues of $730,000 annually for the first 10 years, and $2.8 million annually thereafter. The existing Ajax Plaza is more than 60 years old, and the 32 property owners within will have their holdings expropriated for fair market value by the Town prior to demolition, according to the plan. The project will begin following approval of the site plan and a designated amount of residential sales for the project by developer Grand Harwood Place Ltd. Mayor Steve Parrish indicated that construction will likely begin in about two years.